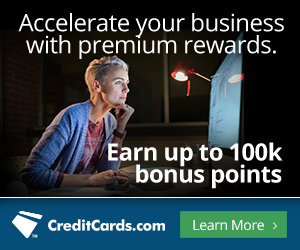 Find credit card offers – bonuses up to 100,000 points, travel rewards, and 0% APR credit cards. Compare the best Business Credit Cards. You should get rewarded for your business expenses right? Now you can! Every dollar you spend on your company can get you BIG rewards. Why pay for travel and vacations when you can pay for your business class flight with reward points? Get a big bonus when you sign up! Earn free nights with your favorite hotels. 0% Balance Transfers up to 21 Months! 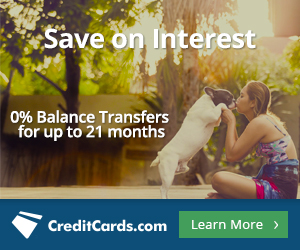 Save big on interest payments when you do a balance transfer. Stop paying big interest to your current credit cards! Pay zero % for up to 21 months. Take your time to pay off your purchases without the extra cost. Find the best Cash Back credit cards! If you're not earning at least 2% up to 5% or 10%, or lots of points, you may have the wrong credit cards! Compare the top cash back credit cards that will let you earn cash back on your purchases!